In 2008, club member Judy Luffman, donated a beautiful award to be presented annually to the club member who best embodies the spirit of the club. To select the recipient, a call for nominations is sent to all club members in the fall. Once the nominations have closed, club members are notified and asked to vote for the person who they believe is most deserving. 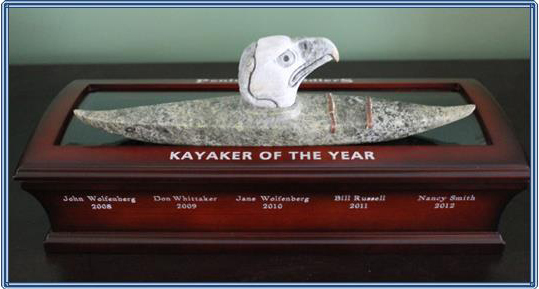 The Kayaker of the Year Award is presented to the selected member at the club’s annual year-end social. The following are the criteria for nominating a member for this special award. Volunteering – giving freely of their time, energy and expertise (not necessarily at the forefront). Congratulations to all the reciepients! To Paddle or not to Paddle? Please be advised that as of Spring 2017 all paddlers are required to wear a life jacket.